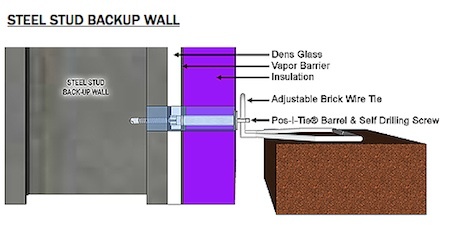 The POS-I-TIE® is a two piece system for attaching Brick and Stone Veneer to various existing backups. It incorporates a barrel-screw piece which allows easy installation using an ordinary drill with a special chuck adapter. For backups with insulation or gypsum board, the screw penetrates the insulation, screws into the backup, and then prevents moisture penetration by sealing the hole in the insulation with a neoprene washer. The barrel is manufactured of ZAMAC 3 - a 92% zinc alloy. The screws are heat treated and Stalgard® coated for maximum corrosion resistance. Heckmann Standard Pos-I-Tie - Steel Stud -2-1/2"
Heckmann Standard Pos-I-Tie - Steel Stud -3"
Standard Pos-I-Tie - Steel Stud -3-1/2"